Inside the thin chassis is an Intel Core i7-8750H CPU, Nvidia GeForce GTX 1070 with Max-Q GPU, 16GB of DDR4 RAM, and a 512GB SSD. The m15 has a full-sized RGB backlit keyboard that’s split into four different lighting zones – three on the main keyboard, and another for the number pad. The Alienware logo power button, just above the display, and the logo on the lid also boast RGB lighting that’s customizable. As for expansion ports, the m15 has quite a few. There’s a full-sized Ethernet jack, a USB 3.1 port (with PowerShare for charging your phone when the lid is closed) and a headphone jack on the left side, with two more 3.1 ports (sans PowerShare), on the right side. The back of the m15 is where you’ll find the charging port, Alienware’s Graphics Amplifier Port, a USB-C Thunderbolt 3 port, a miniDisplayPort, and an HDMI 2.0 port. 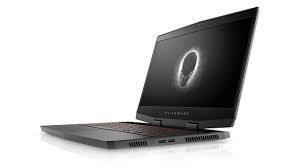 I would love to see Alienware take the Graphics Amplifier Port used to connect an external GPU to the laptop and make it a non-proprietary Thunderbolt port. It is a handy feature as-is, of course, as it allows you to still game with the laptop long past the GPU’s shelf life by just hooking up a desktop card of your choice, but it’s a shame you’re forced to buy its proprietary enclosure to do so. Alienware’s Command Center software is the star of the software show, and is used to view device stats, control cooling profiles, and customize keyboard lighting and effects. Overall, Alienware’s Command Center software would be useful if it wasn’t so hard to read. I have a hard time telling the various buttons and accompanying text apart when using the app, regardless if I’m using the dark or light theme. Actually, I think the dark theme is the worse of the two. There’s just too much wasted space in the layout of the app for the buttons and text to be as small as they are. Not only is the interface hard to read, I could never figure out how to activate some features, such as a performance profile to increase fan speed and help the system cool down. Outside of adjusting the keyboard lighting, I can’t see myself ever using Command Center unless it becomes easier to read and use. Aside from the Command Center app, Alienware also includes a handful of Alienware specific programs. The only one that’s really useful is Mobile Connect to pair a smartphone with the laptop, which is helpful for reading texts while using the PC. You’re on your own for any sort of virus protection, as there isn’t any pre-installed, which is a beautiful thing to see. When it comes to gaming on the m15 and not just running benchmarks, I had a blast using this laptop. The slim footprint left me with feeling like I was cheating, because a laptop shouldn’t be this small and still have the power to play Fortnite at 115 frames per second on Epic settings. With Black Ops 4, the frame rate stayed between 95 and 105; again, with nearly all settings maxed out. Backing off a couple of the graphical settings it would have been easy to increase the frame rate to take full advantage of the 144Hz panel, but I didn’t feel like the experience was lacking with the settings I used. If anything, the display is a little undersaturated, but I’m nitpicking. The keyboard has a reassuring feel to it, with adequate spacing between keys. I had no issue switching between typing and gaming, nor was there a learning curve at the beginning of my testing. At this price point, I would like to have per-key lighting instead of zones, but apparently it’s the result of the thin chassis, as there’s not enough room for the individual light switches for every key, so it’s a tradeoff that I don’t mind. The only irregularity I experienced was when playing Black Ops 4, as there was a small box that contained the GPU temperature that kept showing up after a few minutes of playing. The red text was in a teeny, tiny box at the top of the screen and it would read anywhere between 85˚C and 90˚C, and more often than not, the alert would remain present throughout an entire match, disappearing only once I was back in the lobby. This is the first time I’d seen this alert, despite testing multiple laptops with Black Ops 4. Prior to the alert in Black Ops 4 catching my attention, I did notice that the top-left quarter of the m15 would get hot to the touch. Even the WASD section of the keyboard would get warmer than what I’m accustomed to when gaming, but never uncomfortable. Despite the housing itself getting hot and the alert in Black Ops 4, I don’t think there’s anything to worry about with the m15 overheating as I never experienced any crashes or lockups. Whenever a laptop is this thin, it’s expected that battery life is going to be an area that suffers, especially with power hungry components like this. The m15’s battery life, however, was actually impressive. With the display brightness set to 50-percent, the keyboard lighting disabled, and Bluetooth and Location services also turned off, the m15 lasted for 223 minutes in my 4K video rundown test, which is three hours and 43 minutes. The Razer Blade 15 still tops the chart for the same test, lasting 363 minutes, but the m15 has now taken the second step on the battery life podium. A more traditional (e.g. bulkier) laptop like the Asus ROG Zephyrus M lasted 177 minutes for comparison. 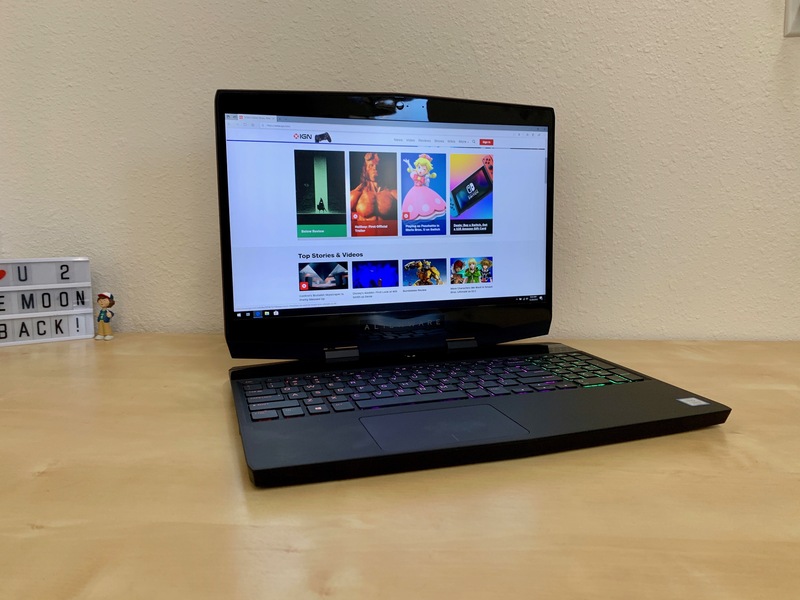 Overall Alienware has done a tremendous job in squeezing every bit of power it can from a laptop that’s incredibly thin, in a market segment where battery life isn’t usually a priority. There isn’t an m15 with a specific MSRP as it depends on the configuration you want, and there’s myriad ways to configure this laptop. Generally speaking though, prices range from $1,379 to $2,349, and the configuration I reviewed is on the higher end at $2,260. The Alienware m15 is well-designed, powerful, and has great battery life too. Its all-new design looks fantastic, and doesn’t skimp on power. Its software could use some polishing, but the hardware is top-notch.